Albert Einstein? Bob Samples? Apocryphal? Does this quotation interest you enough to investigate? The metaphoric mind is a maverick. It is as wild and unruly as a child. It follows us doggedly and plagues us with its presence as we wander the contrived corridors of rationality. It is a metaphoric link with the unknown called religion that causes us to build cathedrals — and the very cathedrals are built with rational, logical plans. When some personal crisis or the bewildering chaos of everyday life closes in on us, we often rush to worship the rationally-planned cathedral and ignore the religion. Albert Einstein called the intuitive or metaphoric mind a sacred gift. He added that the rational mind was a faithful servant. It is paradoxical that in the context of modern life we have begun to worship the servant and defile the divine. 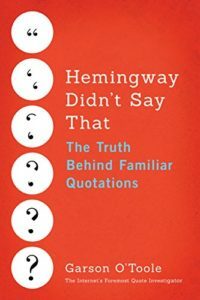 QI hypothesizes that the words of Samples have been altered over time to match the modern quotation given by the questioner. Also, the resultant expression has improperly been assigned directly to Albert Einstein. In addition, the reader should note that the final sentence is presented as the opinion of Samples and not Einstein. This quality — invention — is what led Einstein and others to view the intuitive qualities of the metaphoric mind as a “sacred gift.” It is enriched by an infinity of knowings, and it ceaselessly repatterns these to a compound infinity of possibilities as it wanders across the face of the world. Albert Einstein once spoke of intuition as a sacred gift and likened rationality to a faithful servant. Our basic purpose was to shift the tendency to worship the servant and ignore the sacred. Note that the second sentence reflected the goal of Samples. Albert Einstein (Samples, 1976) viewed the intuitive mind as a sacred gift and the rational mind as a faithful servant. In order to truly enhance adult learning, continuing educators must develop appropriate techniques that capitalize on both modes of knowing by actively involving individuals in the process of learning. In conclusion, QI believes that this saying was derived from the words of Bob Samples who was presenting his individual analysis of Albert Einstein. The phrasing evolved over time, and by 1997 someone had placed quotation marks around the descendant expression and had assigned the words to Albert Einstein. However, the ascription to Einstein is spurious.